My pears in red wine recipe offers a simple, yet very special way to enjoy new season pears. 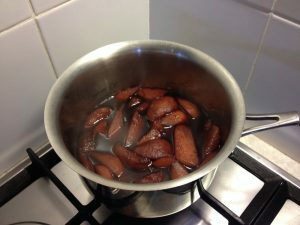 The spicy red wine syrup adds warmth and richness to the pears, without overwhelming their natural sweet flavour. Pears in red wine is a wonderful dessert to complete any dining occasion. Total preparation and cooking time 1/2 hour. 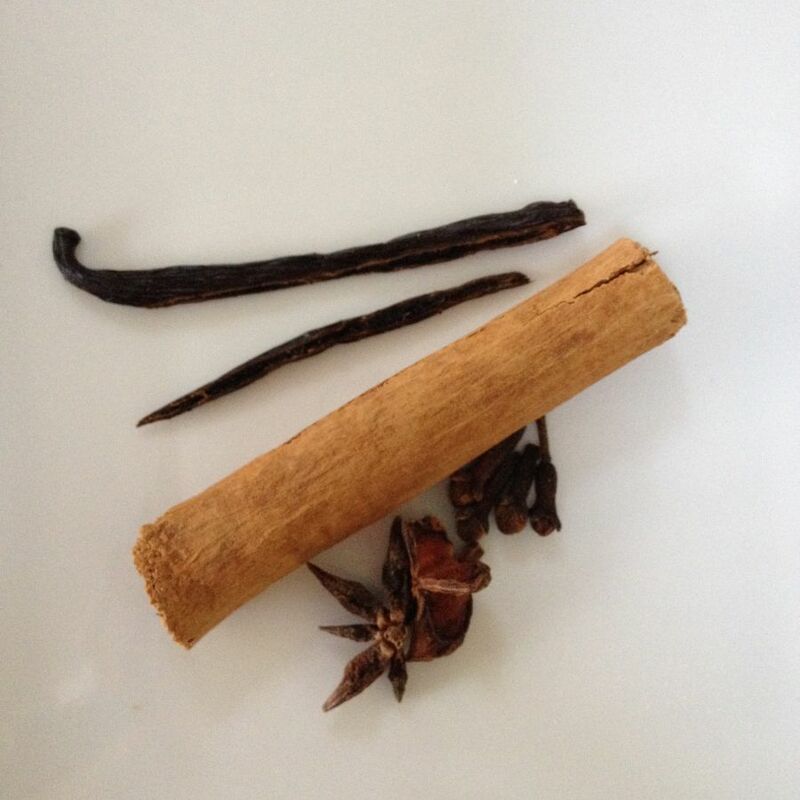 Warm the wine, sugar and spices on medium heat in a covered pot. Once the red wine mix is gently boiling, remove the lid to encourage evaporation. Maintain the heat so the mixture will gently boil. Prepare your pears whilst the syrup is reducing. Add the pears when the syrup has thickened. The syrup will reduce by about one third in volume. This takes about 10 to 15 minutes. 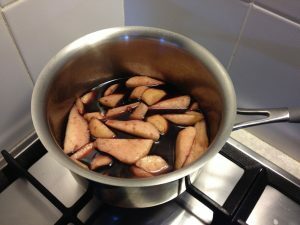 Taste the pears in red wine syrup during cooking, so you may adjust the spice and sugar content as required. Gently simmer the pears until they are soft, but still firm. Ripe pears are naturally softer and will require less cooking time. Remove the cooked pears from the heat and cool. 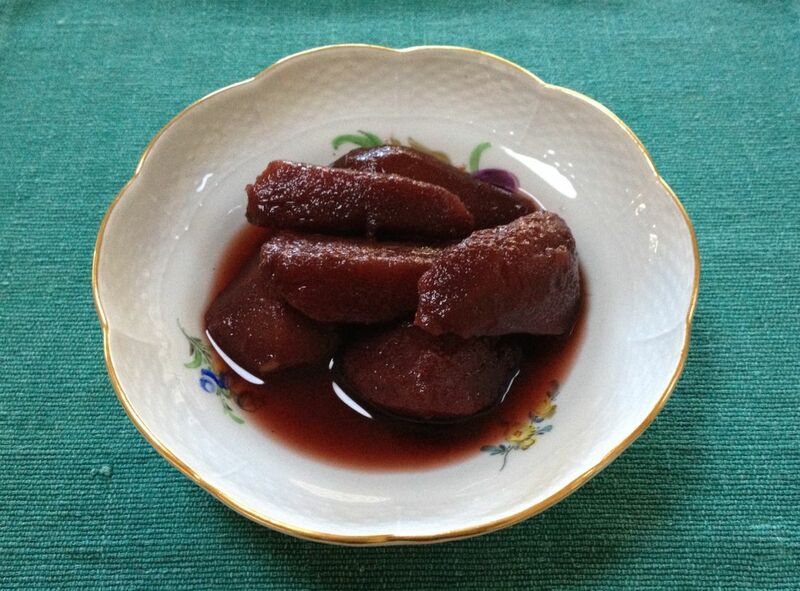 The pears in red wine may be enjoyed warm or chilled. 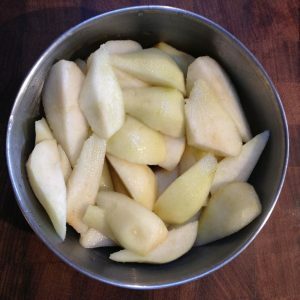 Store the pears in an airtight container in the refrigerator. They will keep well for up to two weeks. The pears in red wine are suitable for heat preservation. Please refer to the instructions in the preserving pears recipe, if you are interested in long-term cupboard storage. Pears in red wine may be served alone or with vanilla custard, plain yoghurt or vanilla ice-cream. The pears may be served warm or chilled. The sweet and spicy flavour of the pears doesn’t require an accompaniment, so feel confident in serving them alone.